Natural Language Processing for the rest of us. OpeNER is a project funded by the European Commission under the FP7 (7th Framework Program). Its acronym stands for Open Polarity Enhanced Name Entity Recognition. OpeNER excels at detecting sentiments, opinions and named entities in texts. Get more information in the getting started guide. All source code of OpeNER is freely available and ready for you to use. Visit the Getting Started section to get some help on installing OpeNER on your local machine. Jump right in and get started. All of OpeNER is available as a webservice. OpeNER is currently available in Dutch, English, German, French, Spanish and Italian. Is your language not in the list? You can add it yourself if you want. The OpeNER components have been proven and tested on news and hospitality reviews. It is pretty easy however, to add your own domain. There are well written manuals available on how to extend the OpeNER technology to your domain and in your languages. Visit the getting started page to get started. This demo was created to show you what the different OpeNER components can achieve. 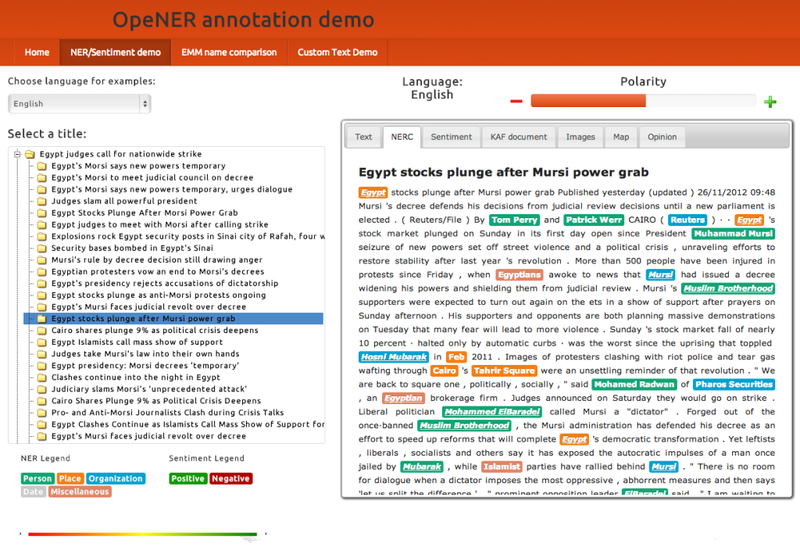 The demo uses the OpeNER Webservices to analyze it's texts. Visit the OpeNER Analysis Demo.